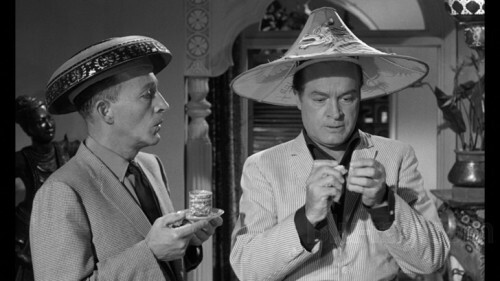 The Road To series starring Bing Crosby and Bob Hope is one of those classic comedy series that I some how missed growing up. So I was excited to sit down and watch one of them finally. While this certainly was a joy to watch, I’m sad my first one was the last in the series as I’m sure it’s not as good as the ones that came previous. Released in 1962, The Road To Hong Kong was the seventh and finally Road movie coming ten years after the previous installment The Road To Bali (1952). This one tells the very silly story of two shysters Harry (Crosby) and Chester (Hope) trying to make a quick buck in Calcutta. When Chester loses his memory after an accident they go to a temple where he is given an herb that not only brings his memory back but gives him, ever so briefly, a photographic memory. 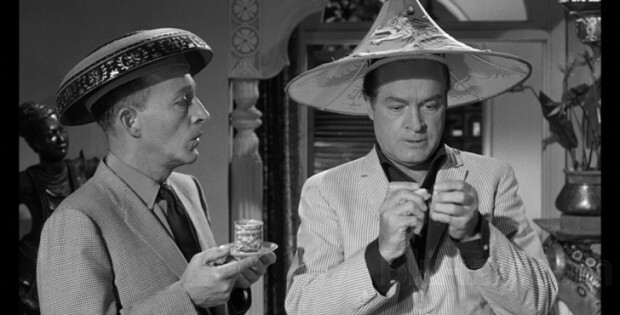 Later, after case of mistaken identity Harry and Chester wind up with plans for secret rocket fuel that Chester memorizes as Harry burns the paperwork. The secret agent in charge of the plans, Diane (Joan Collins) offers to pay them a large sum of money of Chester will repeat the plans to her boss, Dr. Zorbb (Walter Gotell) an obvious Dr. No, knock off; or as some today might look at it, the original Dr. Evil. This film is wall-to-wall high jinks. If you’ve ever seen a Road to movie, you know how silly they are. They often break the fourth wall and talk to the camera, asking “special effects” for help when they find themselves in a jam they can’t get out of. There tons of meta references to the previous films. In one scene they ask a pair of thugs if they’ve ever seen any of the Road pictures. When the thugs say no, they pull there classic patty-cake-punch on the two and escape them. As the film goes on it just gets sillier and sillier. Chester winds up with a his cloths full of fish that are popping out all over the place and Harry, Chester, and Diane find themselves trapped on an alien planet all alone. That is until Frank Sinatra and Dean Martin show up! Peter Sellers all makes a pretty fantastic cameo in the film. The Road To Hong Kong is certainly a very flawed film. Maybe some of it is just jokes that haven’t aged well, but I think some of it was people trying to recapture the magic of a film series that had been retired for ten years. Yes, I haven’t seen the previous installments yet, but I can only assume that they are a lot better than this one. That said, it’s still a funny movie, and if you can get on board the silly type of humor they are conveying here, then you’re sure to have a good time. The film is presented in a 1.66:1 aspect ratio and DTS audio. The film looks and sounds fantastic. It’s been very well preserved. You get the original trailer. I wasn’t sure what to expect going into this comedy, but it wound up being pretty darn funny. I wasn’t expecting all the meta humor and fourth wall breaking which was very silly fun. Olive Films presents The Road To Hong Kong. Written by Norman Panama and Melvin Frank. Directed by: Norman Panama. Songs by Sammy Cahn and Jimmy Van Heusen. Starring: Bing Crosby, Bob Hope, Joan Collins and Peter Sellers. Running time: 91 min. Rating: Not Rated. Released on DVD: February 17, 2015.